Are you looking for the best mouse for photo editing? We hear you. Photo editing requires a lot of patience. Creativity and an eye for beauty are unmistakably found in every photo editor – professionals as well as beginners. But patience is something that comes with time. And with the insurmountable patience, you require tools and devices that you can use to achieve the results you want. Photo editing software makes things a lot easier but the devices used by the photo editor like the keyboard and the mouse can make a huge difference too. Hours of sitting in front of the computer and using a mouse to reach perfection in a photo can be very distressing if you do not have the right mouse with you. We have created the list where you will find the best mouse for photo editing, 2019 which will help you buy a mouse that will be just perfect for you – ergonomic, sensitive and efficient. Photo editing requires a completely different set of tools to achieve the right effect. You need the right mouse to achieve perfection in photo editing. A good mouse can make the task of a photo editor much easier and enhance the productivity, as it needs a lot of precision and patience. Normally, people use the mouse and the keyboard that comes along with the computer or notebook. However, these are not ideal for photo editing, where precise movements are needed, especially in case of high-resolution displays. Here is a list of the some of the best mouses that will give photo editors the optimum levels of control as well as freedom in movement. Some of them are marketed for gamers, but these are equally good for photo editors, photographers, digital artists, graphic designers and other such professionals as well. There are different types of mouses, like the basic one; the trackball type; the multifunctional-type; and ergonomic ones. It all depends on the type of work you do. A basic mouse may not work for someone who is doing plenty of photo manipulations and editing images of high resolutions, for instance. The vertical ergonomic design helps relieve strain for professionals who work on their computers for a long time at a stretch. At the bottom, there is the compartment to keep the battery and also a slot for the USB receiver. Just plug this receiver into your notebook or computer, put in an AA battery and start using the mouse. The battery life is excellent and is also rechargeable. 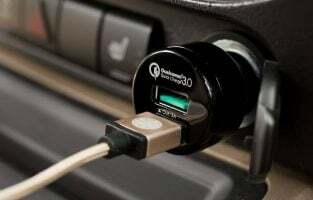 The Quick connect design on the mouse allows you to change from wireless mode to a charging wired mode if the battery runs out. It has the usual left and right buttons along with the scroll wheel. In addition, there is a button for changing DPI levels, ranging from 800; 1200 to 1600. The tracking technology used is an optical one, offering precise tracking on different types of surfaces. The dimensions of the mouse are 5.0 x 3.0 x 2.5 inches and the weight is 5.9 pounds. The size is compact and fits perfectly in the palm of your hand. Photo editors who want to minimize the strain on their wrist and the forearm and who work for hours on their computers. Those looking for a compact, small mouse that is convenient to carry around. Suitable for web surfers; gamers and professionals who work for a long time on their computers. This comes in a convertible design and you can pack it flat as well while travelling. It has a scroll wheel that is also touch-sensitive, which is innovative, as well as convenient for use. For scrolling, users only need to drag the finger along the metal tab. The buttons for the basic left and right clicking functions are physical ones. It also offers support for accelerated scrolling, so that you can scroll quickly to the bottom of a document. A full scrolling plan allows both vertical and horizontal scrolling. Another interesting feature is the vibration feedback, offering a precise feel to scrolling. You can also adjust the scrolling speed and the vibration experience in the software. It is compatible with Windows 10; 8.1 and 8 and should be enabled with Bluetooth 4.0 version. The mouse functions on the company’s proprietary BlueTrack, a laser sensor that offers a sensitive cursor response that can be used on different surfaces. Setting up the mouse is also easy. You just have to put the batteries in and connect the USB RF receiver to your device. The battery life is about 6 months. You can make adjustments to scroll speed etc. using the settings software, which you can download from the company website. Photo editors who are ready to buy a more expensive option with excellent technical features. Those who want to make a fashion statement and have an eye for excellent design and new technology. Those who want a compact mouse while travelling, as it comes in a collapsible design. 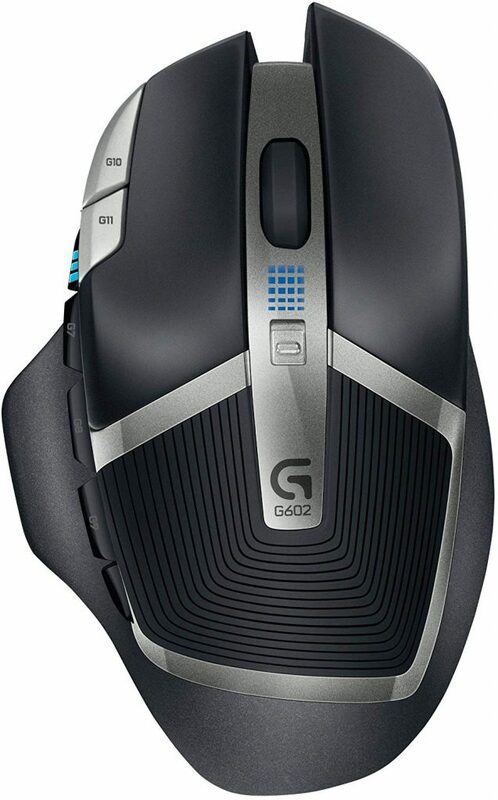 Logitech is famed for making some of the most reliable accessories and the G602 is no exception. It is well designed and offers good value for the price. One difference in the design is a small thumb rest on the side for support. The ribbed rubber also offers good grip. 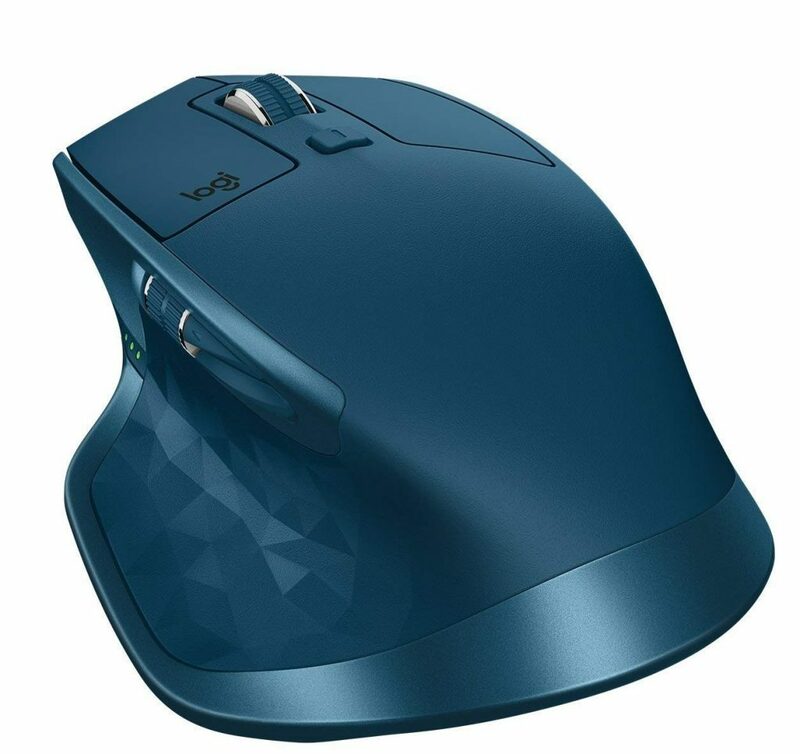 The mouse has a natural curve and the design is comfortable. The bottom is smooth and glides well on most surfaces. It weighs around 107 grams. There are totally 11 buttons present on this mouse. There are the usual left and right clicking buttons. In addition, a button for changing performance mode; DPI toggles to increase or decrease; 6 side buttons that are programmable; and the usual scroll wheel. All the buttons are well placed and easy to access. The DPI range is between 250 and 2500. It has an accurate Delta Zero sensor and a polling rate of 500 Hz. The mouse uses two AA batteries for power, but it can also work with one AA battery for about 125 hours, whereas the normal battery life is 250 hours. The mode switcher button can be changed from ‘performance’ to ‘endurance’ to extend battery life, though accuracy could be hampered in this mode. It is compatible with Windows 10; 8; 7 and also Windows Vista and the Mac OS X 10.6.8 and above. For photo editors and professionals as well as gamers. Those who are looking for a comfortable grip in their mouse. Suitable for casual gamers, as serious gamers need DPI of more than 4000. This is a palm grip type of mouse for professionals like photo editors and for gamers. It comes in a comfortable design and offers plenty of options for customizing. You use the index finger for controlling left button; the middle for controlling right button; and the ring finger controls the macro functions. The thumb takes control of 12 buttons, out of the total 20 buttons. It comes with polytetrafluorethylene feet that offer minimum friction and moves smoothly on most surfaces, offering precise movements for the cursor. It weighs 4.69 ounces and measures 4.6 x 2.9 x 1.6 inches in size. It comes with highly customizable software. There are 6 profiles with three of them stored in the mouse and the others on the computer. You can program 18 of the total 20 buttons, as the other two buttons are the usual right and left click buttons. The G shift button operated by the ring finger allows users to instantly double up the actions that they can perform with each button. If you are aesthetically inclined, you will be happy to know that you can select the color on the LED buttons. You can also change the DPI from 200 to 8200. Tracking fidelity is excellent at all DPI settings and there are very few inaccuracies. It is compatible with Windows 7 and 8 as well as Windows Vista. For photo editing professionals as well as gamers, as it offers pinpoint precision and several buttons. Suitable for those playing MMO or massively multiplayer online games. For those looking for a mouse that can also offer some keyboard functionalities. Suitable for right-handed users, as it is confirmed to suit them. Those who are ready to spend some time understanding the different button combinations. The shell is made of a rubbery plastic material which is non-stick and comfortable to hold. It is not ergonomic, but vertical in shape with all surfaces being tilted, keeping the arm and the wrist most comfortable. It has only one side on the left, which is concave with room to rest the thumb. The dimensions of the mouse are 120 x 62.8 x 74.8 mm and the weight is 3.4 ounces. Its weight is 95 grams and it is rather lightweight for its size and easy to use reducing wrist tension. Both the left and right buttons are quick and the scroll wheel is also efficient. There is a DPI button as well that can be used for different settings from 800; 1200 or 1600. It affords smooth and accurate tracking on most types of surfaces. The next and previous buttons offer convenience when you are browsing web pages. It has a medium quality sensor. As for connectivity, it broadcasts over a frequency of 2.4 GHz. It does not offer support for recharging, though you can use rechargeable batteries that have to be recharged outside, not within the mouse. 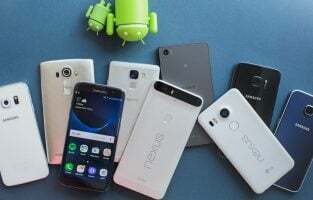 The battery, however, does last for about three months, as there is an auto shut down feature. Batteries, however, are not included in the package. You get a 2.4G USB receiver placed at the bottom of the mouse. The ergonomic design is suitable for professionals who use the computer for extended periods, as it reduces strain on the wrist. 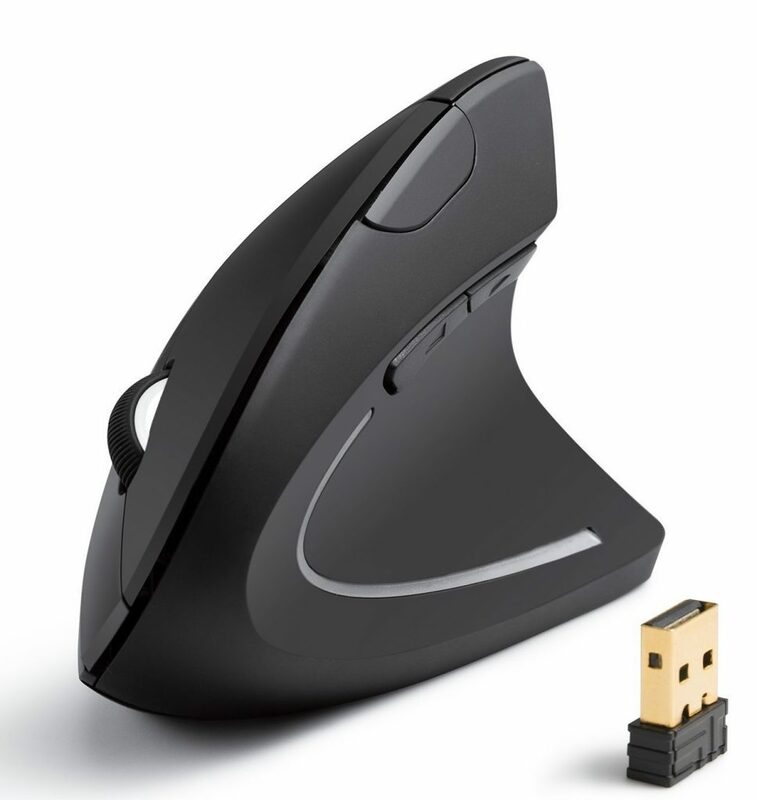 For right-handed people, there is no left-hand version of this mouse. Those who want a sturdy, stunningly good, lightweight mouse for professional or productivity purposes. Also suitable for casual gaming. It is one of the best-selling mouses of the company through the times. 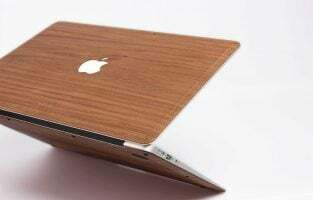 It is meant for productivity and comes in a nice ergonomic design and a subtle finish, with plenty of features that are useful for photo editors and other professionals. The latency is low and the precision is high. You can access different functions through the customizable buttons. The dimensions are 5.0 x 3.4 x 2.0 inches and it weighs 145 grams, which is a little heavy, but well balanced. There are the usual left and right buttons along with the scroll wheel in the middle. In addition, there is one more wheel near the thumb grip to scroll horizontally. The five other buttons are the back; forward; gesture; mode shift; computer selection buttons. The Darkfield sensor offers high accuracy in tracking up to 4000 DPI. 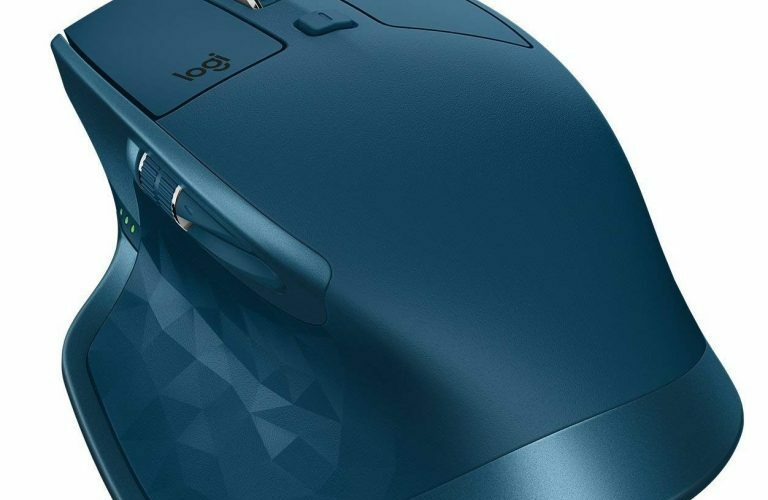 The Logitech Flow feature also enables users to connect the mouse to three different devices at the same time, so that you can move seamlessly, copy, paste files easily. 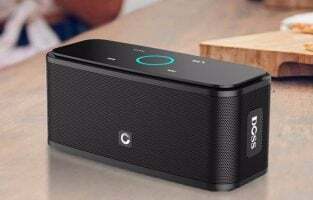 Connectivity is through Bluetooth or through the Logitech Unifying USB receiver. It can truly enhance productivity. For instance, you can edit videos in one device, reply to emails in another computer and even play a game in the third without switching the mouse. The battery life is also excellent averaging about 70 days. This is a rechargeable battery of 500 mAh. Ultimate option for photo editors and productivity purposes, as it can capably and efficiently transform creativity of all kinds. Those who are looking for high customizations and personalization of buttons for productivity and excellent tracking accuracy. Suitable to meet demanding productivity tasks, like word processing; web surfing; processing images; videos; graphic designing and so on. Suitable for gaming, but only for non-FPS ones. 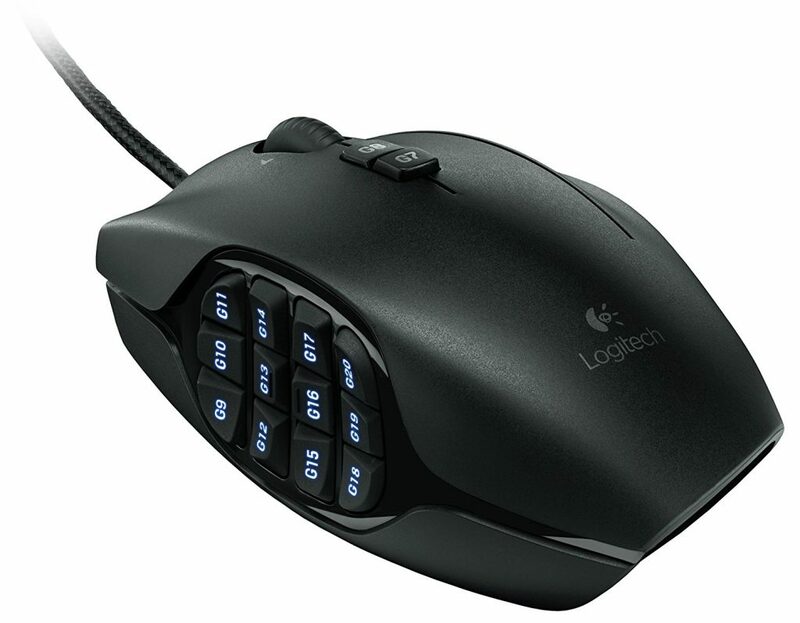 This is the most advanced wireless trackball mouse from Logitech suitable for Windows PC as well as for the Mac. It needs 20% less strain from your muscles as compared to a basic mouse. One major unique feature is that it comes with a hinge that can be adjusted so that you can choose any angle from zero degrees to 20 degrees for a natural position and comfort of your hand. Another new feature is that it has a Precision Mode button on the side, over the ball. Using this button, you can make changes to the speed and resolution of the trackball. Photo editors will find this feature very useful when making small adjustments using the cursor, as it is easier to control. The battery is rechargeable and can be charged with the micro USB cable that comes with the package. The USB is placed on the trackball front portion. You can also view the battery status along with a warning LED on the trackball. The battery normally lasts for about 4 months with one full charge. You can connect the mouse to two computers. 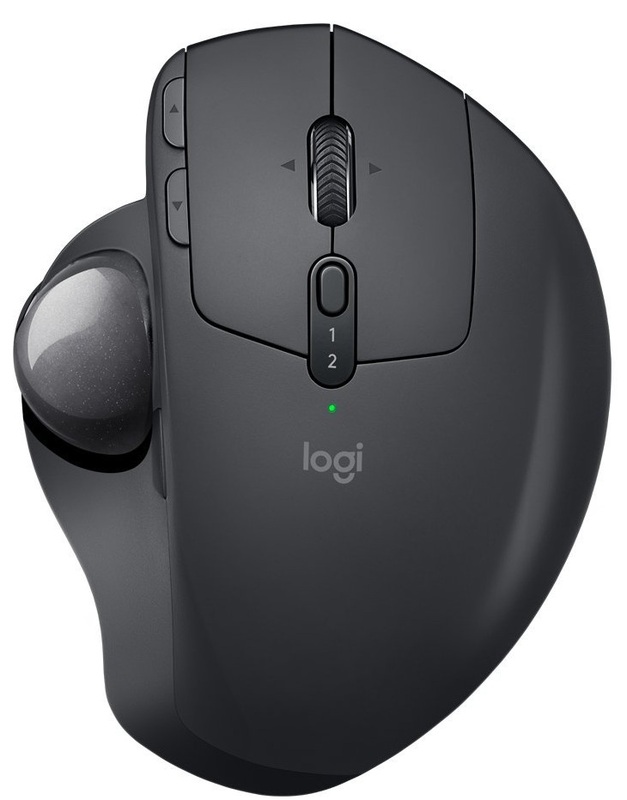 You can use either the Bluetooth or the Logitech Unifying receiver for connecting, with one unifying receiver being included with your trackball. There are plenty of buttons on the MX Ergo mouse. There are the usual left and the right buttons and a middle button. You can roll the scroll wheel either up or down and also tilt it to both the sides for different events, so the scroll wheel allows for 4 different events. Then there are the forward and the back buttons, making the total come to 9 buttons. 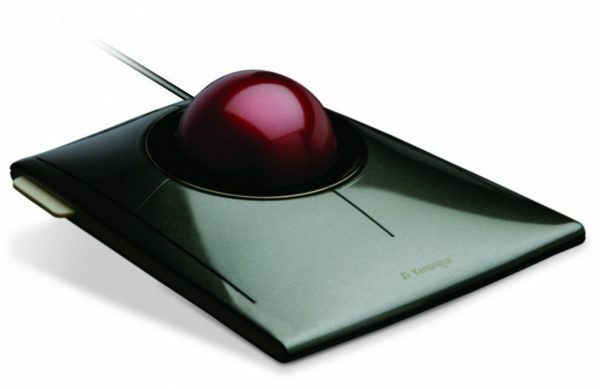 This is meant for photo editors and other productivity tasks who are trackball enthusiasts. It is a kind of three in one mouse, as it has three side plates that can be interchanged so that you can use 2, 7 or 12 buttons for all commands. It weighs just 147 grams and is comfortable to grip. The side buttons are easy to use for quick transitions. You can also customize them using the Razer Synapse software. There is the usual two buttons option. In addition, you have the 7 button side wheel with a rubber center and a 12 button area rather like a calculator for MMOs. This makes a total of 19 buttons. You can also create several profiles using the Synapse software, with each button having different customization possibilities. All mouse and keyboard functions are available along with macro settings; switching to a particular profile, personalized launching programs, Windows shortcuts and so on. 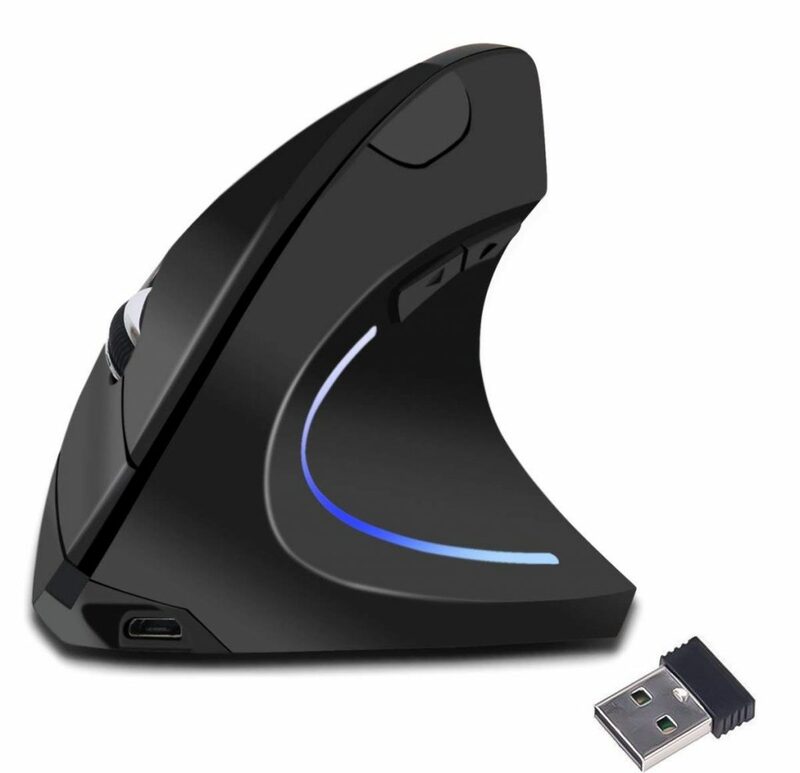 The mouse also offers several sensitivity options with 5 DPI speeds ranging from 800 DPI to a maximum of 16000 DPI. The IPS is 450 and the acceleration is 50G. Professionals who need plenty of customization options to enhance productivity. For those who are into MMOs and MOBAs. Those looking for an incredibly accurate optical sensor. 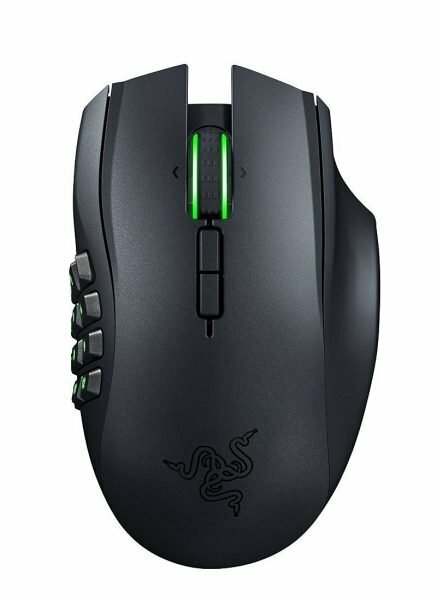 This mouse is a gamers dream, and we know that you may not be a gamer, but it fulfils your needs as a photo editor very effectively. It is known to have the most accurate sensors which means it is quick when it comes to making changes, and it has a wheel that allows you to make accurate moves while editing the photo. The layout is very comfortable and the textured grip is great when you are using it for long hours. 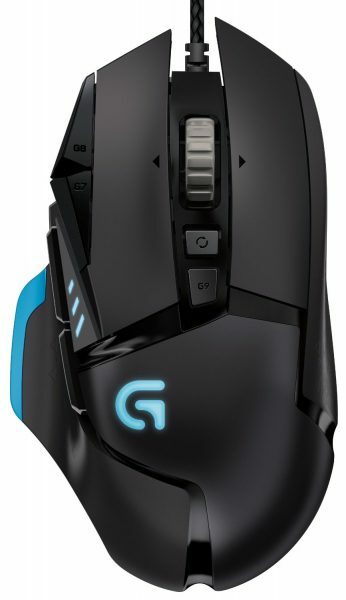 The Logitech-G Delta Zero optical sensor ensures that the mouse can track every move very accurately making it the best mouse for editing photos. It can be used on Windows as well as Mac computers. Photo editors and graphic designers enjoy using this mouse with 19 programmable buttons for quick editing. It is comfortable and its ergonomic nature allows you to work with this mouse for long stretches of time. It is wireless so you do not have to deal with wires any longer and the mouse is very responsive which helps in getting the editing done quickly. With its extensive features, it does have a higher price tag, but most of the users who buy this mouse end up finding it worth the money paid for it. Photo editors often find the slow eradication of the trackball from the mouse to be unwanted because trackballs can make things a lot easier from a photo editor’s point of view. The Slimblade Trackball Mouse is a great photo editing mouse which ensures that you do not have to move your arm and wrist too much for scrolling or moving around the photo. The trackball will help you save a lot of time and energy by efficiently manoeuvring on the photo to edit it. 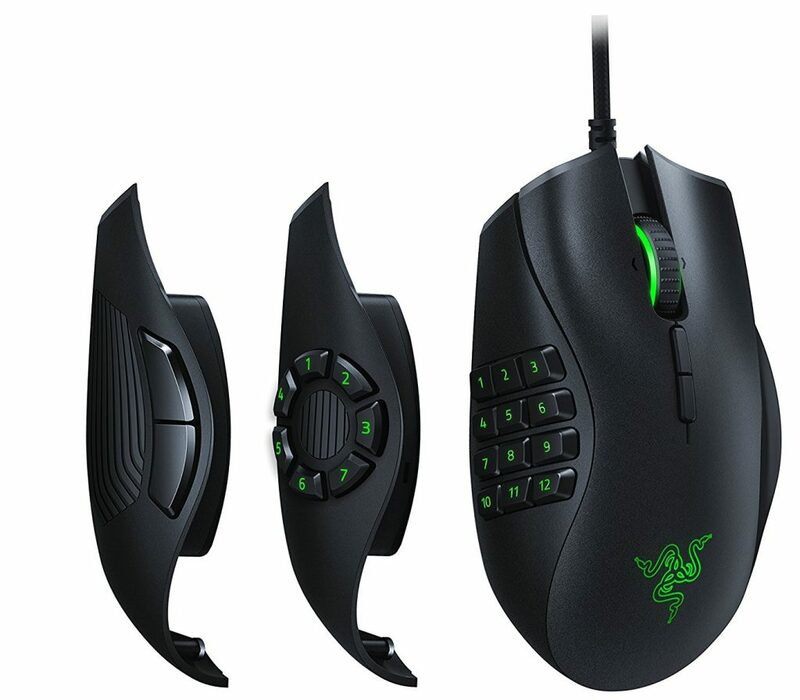 It features four customizable buttons and a large trackball. Users love the comfort with which it can be used. The mouse is compatible with Windows and Mac computers. 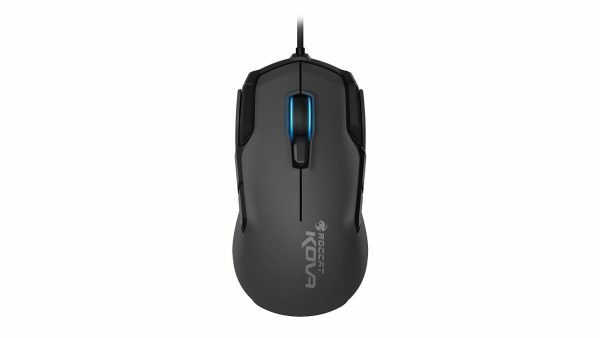 There are 9 buttons on this mouse that works with a high amount of precision. 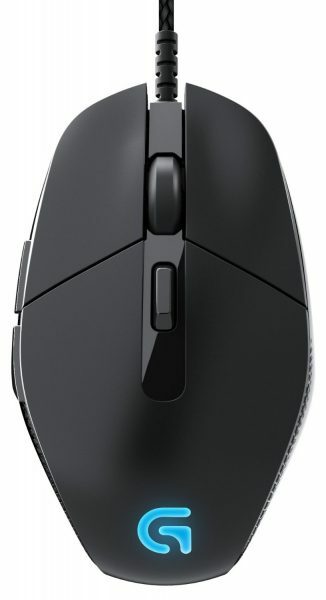 The accuracy of the mouse is reached with the help of its 3200 dpi Pro-Optic R2 sensor. It works without any lag so photo-editing becomes a lot easier. If you are on a budget and you want to invest in a good photo editing mouse without paying too much for it, then the G303 can be a good option. It is designed with comfort in mind so that you can spend long hours editing the photos. The mouse is lightweight which increase the comfort and also helps in achieving higher accuracy with your editing work. The mouse features 6 programmable buttons which can be helpful while using the mouse with photo editing software. It is one of the best mice for Photoshop if you are on a budget. If all you need is a basic mouse without too many additional buttons that is comfortable to use, then consider the Microsoft Comfort Mouse 4500. It is shaped to be used by either hand, which is good news for left-handed photo editors. You can scroll horizontally and vertically with the tilt wheel. Mac users will find the magic mouse 2 easy to set up and its minimalistic design ensures more comfort and higher accuracy. The built in battery is light in weight so that the mouse can be used for a long time without feeling too heavy to the users. It uses Bluetooth connectivity so you do not have to worry about wires or USB cables with the magic mouse 2. 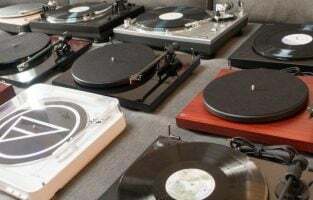 Prices normally range from $20 to $100, but even the cheaper ones can serve the purpose and functionalities. Usually, optical sensors are the best choice, as they offer good cursor accuracy. Also, they can work on any kind of surface, even the glossy ones. Again, wired mouses are preferable, as there is no need to change batteries. However, a wireless mouse is useful when you are on the go. Opt for a higher priced wireless mouse. You can select a Bluetooth or a Wi-Fi wireless mouse, with the latter having a better response rate and it also consumes less energy. Check out the DPI or dots per inch as well. Normally, a DPI of 800 to 1200 should be enough for a low-resolution display, but for 4K displays, it would be better to opt for one with 2000 DPI. Another factor to consider is the polling rate in Hz. The higher the polling rate, the better will be the response, so photo editors usually opt for 300 Hz to 500 Hz. Photo editing is not always the easiest task and most of the time it requires immaculate precision and a lot of patience. This is why it is necessary to have a good mouse which can make your work easy for you. While there are a lot of mice that can be used, the ones that we have listed today are the best that you will come across when it comes to price as well as features. Go through the list and you will find the best mouse for photo editing that will be just perfect for you.